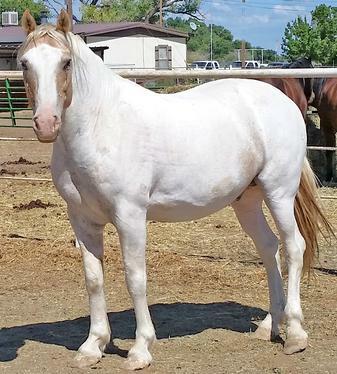 Take a look at the beautiful horses available for adoption. If you'd like more information about a horse to adopt, please contact us at contact@fourcornersequinerescue.org. You can also check out the horses in Rehab and see if there is a special horse that catches your eye there. If so, please feel free to email us with questions as to how the rehab is progressing and when we think the horse will be available for adoption. Our email address is contact@fourcornersequinerescue.org. You can help us support these horses by donating or sponsoring! It costs money to bring these horses back to good health and prepare them for a new home. We appreciate your kindness and generosity! Please note that the horses that are fostered are still available for adoption. Click here for information on the adoption process. 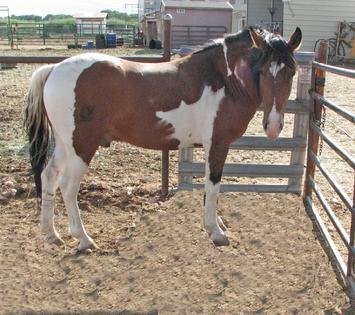 Pecos is an 11 year old paint gelding. Once a wild horse, he is currently in training with our Plan 4 Progress program. Pecos leads, loads, and picks up his feet. The right home for Pecos would continue his training using Natural Horsemanship techniques. If desired, the adopter can continue Pecos in the Plan 4 Progress at no cost. Pecos is smart, engaging and willing to learn. He is NOT saddle trained. Bambi is a sweet young filly. 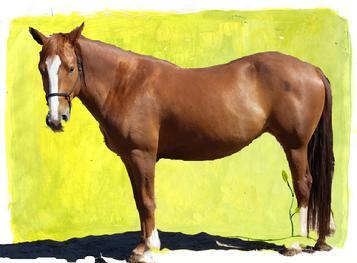 Bambi is 4 years old, sorrel in color and stands about 14.2 HH. She will probably mature to be around 15 HH. Bambi responds well to kindness, and loves to be brushed. She is progressing well with groundwork training -halter & leads well. We are working on getting to pick up her feet She will need a home with a person willing to spend lots of quality time with her. With this girl, slow and steady will win her heart. Bambi is current on vaccinations and deworming. Four sessions with a Natural Horsemanship Trainer for Bambi and her adopter are included in her adoption fee. Rambler is a gorgeous 7 year old dark bay gelding. 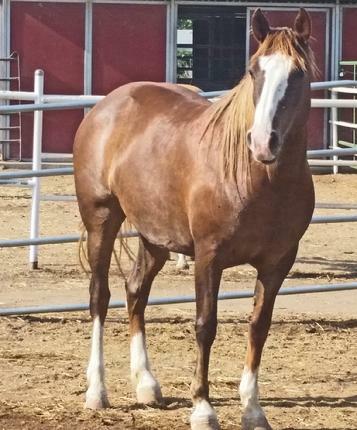 Originally a wild horse from the Thoreau area, Rambler is being trained using Natural Horsemanship Techniques through online and hands on sessions. Potential adopters are encouraged to participate in this training at no expense to them. He stands about 14.3 HH and weighs about 800 lbs. Cee Cee is an 11 year old black & white paint gelding standing about 15 HH. He's had 60 days of saddle training. 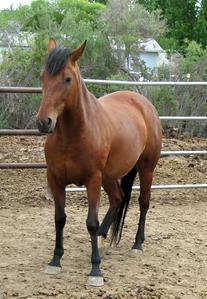 Cee Cee was used as a breeding stallion until he was 9. He will require an experienced rider who has clear boundaries as Cee Cee tends to push past people. Once he knows he can't, he will respect the boundary. He stands good for the farrier and loads without a problem. Cee Cee is up to date on vaccinations, deworming, farrier work and teeth floating. 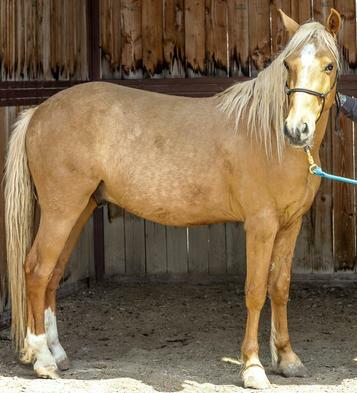 Dickens is a beautiful palomino gelding that was once wild. He is 4 years old and stands about 14 HH. Very smart and engaging, Dickens is still learning to be a good partner. He's friendly and wants to play, but his handler will have to set boundaries and make Dickens honor them. He halters and leads, and is current on vaccinations and deworming. The right home for Dickens would be with a person who will continue Dicken's education using Natural Horsemanship techniques. He is not saddle trained. We are working on his Ground Manners now. 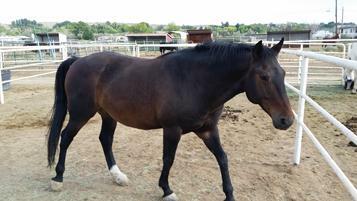 Heart is a 14.2 HH, 17 year old mare from the Gallup area. She has been ridden, but was "broke" rough and has issues with riders. 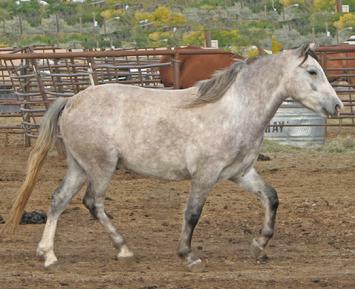 This mare will take a person willing to devote much time to her and skilled in handling abused horses. She is very gentle on the ground, and loves her quality grooming times. She would be a wonderful companion horse. Heart is halter trained, leads and stands for the farrier. She is current on her vaccinations, deworming and teeth floating. Thumper is a 10 year old gelding. Originally from a herd of wild horses rounded up when they trespassed onto state land, he is now transitioning to domestic life. Thumper is so named because he thumps his front foot on the ground when he is feeling anxious. Thumper is incredibly sensitive and will need a calm and steady hand in training. He is about 14.2 HH and weighs about 800 lbs. 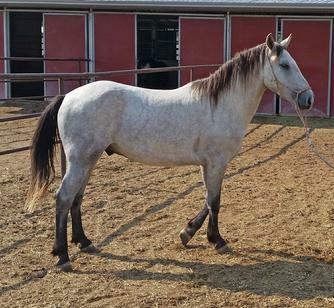 Smokey is a 6year old gelding that was born in the wild. His mother is Callie, a small black mare. Callie was captured around the El Rito area when she strayed onto private land. Smokey is a pony, standing about 13 HH. He retains his mustang instincts, and will need a person willing to spend time bonding with him using natural horsemanship techniques. He leads, loads, and stands for the farrier. Smokey's adoption fee includes 4 lessons for Smokey and his person with a professional trainer. 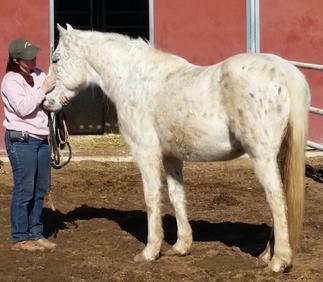 Trudy is a very well built grey mare. She is 10 years old and was found roaming around outside of Cuba, NM. Standing right at 15 HH, Trudy is a stocky girl weighing about 1000 lbs. She is halter trained and stands for the farrier. Trudy is NOT saddle trained, however, she is very gentle and quiet. Trudy is up to date on vaccinations, deworming and teeth floating. Paddy is a well built 6 year old gelding. He is a domestic horse, but has been treated harshly and is untrusting of humans, especially in small spaces. Paddy is gentle and will need a person that can work with him to overcome his fear of people. He is NOT trained to ride. We have started his training using natural horsemanship techniques and he is responding well. Paddy stands about 14.3 HH and weighs about 1000 lb. He has great confirmation and will be an excellent trail partner. Six lessons with a professional natural horsemanship trainer are included in the adoption fee. Paddy is current on vaccinations, deworming, teeth floating and farrier work. Adoption fee for Paddy is $500. Ruth is a beautiful 7 year old mare. 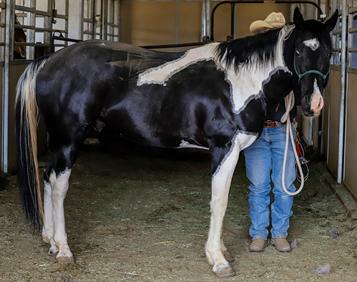 Once a wild horse, Ruth came to FCER after being captured as part of a "trespass" herd on US Forest Service land near Cuba, NM. Pregnant at the time, her baby has since moved on and now Ruth is ready for a new home too. She halters, leads, loads and stands for the farrier. Ruth is NOT saddle trained, and will require the patient hands of an experienced person to continue her training using Natural Horsemanship techniques. She's a good girl, and tries to please. trainer for Ruth and human. 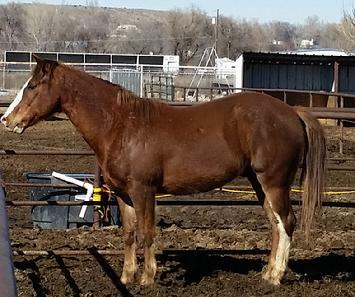 Joe is a nice 13 year old paint gelding standing about 14.2 hands. His people couldn't take care of him anymore due to age and health issues. Joe is gentle, and can be handled. The right home for Joe would use Natural Horsemanship methods to train him to ride. He leads, loads, and stands for the farrier. 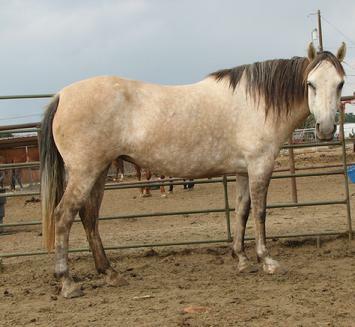 Chama is a 5 year old wild horse gelding from the Chama area of New Mexico. He is now trained to halter, lead and stand for the farrier. Chama is small, about 13 HH and will be a small horse. He is very smart, but shy around people. He will need patient hands to help him become a riding partner. Chama is current on vaccinations, deworming and farrier work.